Japanese artist Kazuki Yamamoto takes coffee art to a whole new dimension: the 3rd dimension. 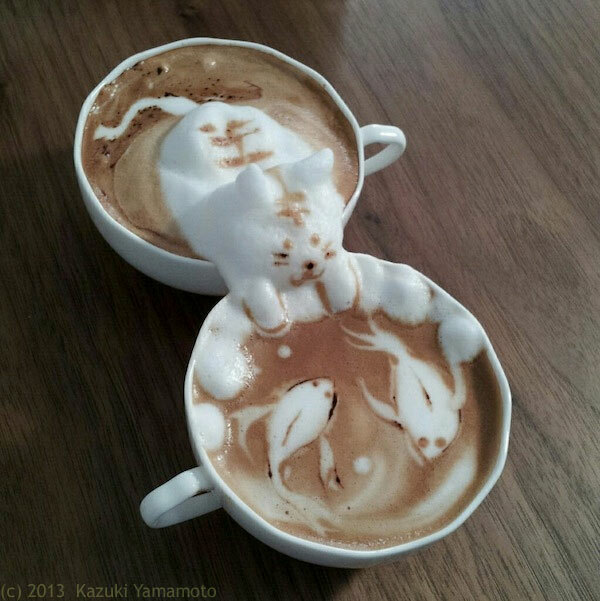 While he already creates exceptional 2d coffee art as seen with the koi fish in the first cup, Yamamoto’s imagination and creativity went to a whole new level when he expanded his art to sculpting with foam as seen by the cat reaching out from the second cup. He brings joy to an ordinary cup of coffee. You don‘t even have to love coffee in order to appreciate these super creative latte foam artworks by Japanese artist Kazuki Yamamoto. …this 26-year old latte artist, based in Osaka, creates actual 3D foam sculptures in the coffee mugs of the Cafe10g visitors. This thinking outside the box – or, rather – outside the cup – even gave Kazuki the idea to make the coffee foam climb out of one cup and reach for another. Now that’s another creative way to play with your food!